This stunning location offers the best of all that Como has to offer. It is a spacious and private position. The villa has all day round sun but also offers the respite of a shaded lake-view terrace for evening aperativo. A short 5 minute stroll down to Argegno offers a village with all the facets of Italian living - restaurants, shops, bars, bakery, tabacci and a home made ice-cream parlour in the Piazza. 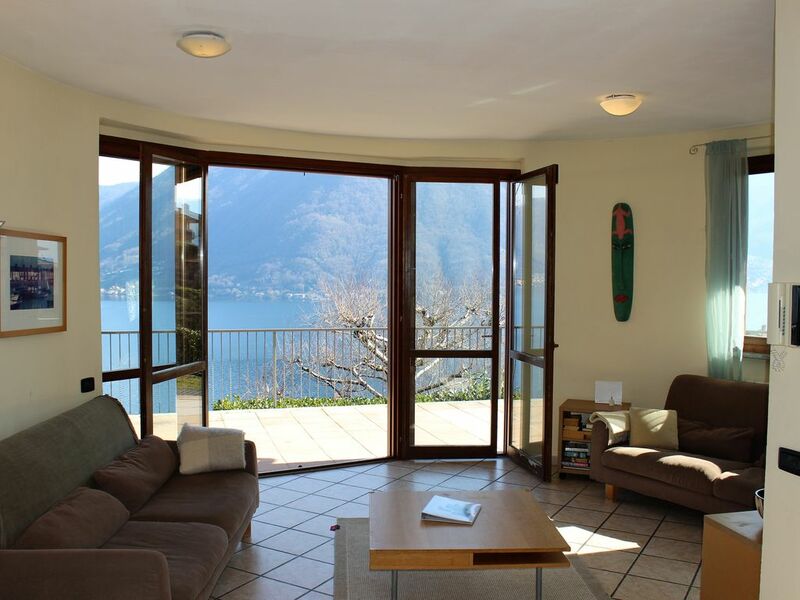 The rest of Lake Como is easily reachable from the ferry service and the public bus links, so your car can be left in the garage or driveway at the villa. Argegno is a central hub of the ferry service, so it is very easy to navigate. Val D'intelvi is behind the villa and this provides hill walking, cycling, paragliding, golf and even ski slopes. In addition the villages of Val D'intelvi offer many gastronomic treasures, which never disappoint. The Italian retail experience in Como, Milan or the luxury brand outlet Foxtown are short drives away. See our website for more photos. Myself and my wife Jules moved to Italy in May 2003. Our daughter Keelin was born in Como in May 2005 and she claims to be Italian.. We had our heart set on lake views and were fortunate to find the perfect villa for us. Stunning views and a short walk to the wonderfully quaint but lively village. We moved to Italy for professional reasons. I took up employment in Lugano, Switzerland. Thankfully I got a frontaliere visa and we availed of the best of both worlds, Swiss work and Italian living. We adore Argegno and it's environs. It has a vibrant village and also there is lots to explore in Val D'Intelvi. I bought two apartments in Argegno in 2008 and we're hoping to spend lots more time there. However mortgages mean that we need to dream for the moment. One word. Vista. The villa was ideal for us, as we hosted so many friends and family members over the years. The villa was large, but yet provides lots of privacy to groups over 4 floors. The location was quiet and not touristy. We lived amongst the locals and now have many friends in Argegno. We could people watch in the village and retire to the peace and privacy of the villa, without taking the car out. The walk down to the village (whilst steep) is short and stunningly beautiful. We never get bored of it. Privacy, ease of access to everything and stunning surrounds. 3 bathrooms - one each floor (except attic/loft). Bathroom 1 with WC, bidet, basin and shower (Taverna). Bathroom 2 with WC, bidet and basin (ground floor). Bathroom 3 with WC, bidet, basin and shower and bath (1st floor with stunning lake views). Ground floor living room - living room with expansive lake panorama. Taverna living room - Cool underground Taverna, which offers respite during summer months. Dining table, TV, Home Theatre entertainment system. Adjoining study offers privacy. Cooker, hob, fridge, freezer, dishwasher, microwave, espresso/cappuccino machine etc. Please see our website for more info. The ski resort is of Madessimo is approx 75mins away by car and boasts numerous runs to suit all levels of skier. Ski during the day and be back in time for dinner that evening. St. Moritz, Flims Laax and many other resorts are withing day trip of Argegno. The Lake Como region has 10 golf courses. The famous and historical golf club of Menaggio is only a 15 min drive away. Lanzo golf course 10km approx. Notes on accommodation: No smoking allowed in villa. Internet access is available for a small extra charge. Outside: Panoramic lake view terrace and garden. Terrace dining table and chairs. 4 Loungers. Two parking spaces and a private garage space. Underground study. Utility Room: Washing machine, iron and ironing board. Cleaning / Towels / Linen / Maid service: Towels and bedlinen included. Final cleaning 150 euros. We were very fortunate with weather and we have a wonderful stay. The villa is spacious and well appointed. It's a great location just above village, but the path down is steep - so prepare yourself. We traveled to Lake Como at the end of June and chose this villa for it's location and view and that absolutely lived up to it's description. The town itself is small but lovely - great mid lake location that made visiting the other lakeside villages very easy via the water ferry. John, the owner could not have been more responsive and helpful throughout the process. The house itself is spacious. No AC but that is typical of the area but it does get warm in the summer, bedrooms do have fans which were great but upstairs room was very warm so luckily we had enough beds with two middle floor rooms and downstairs room to not use the top floor because it would have been very warm to sleep. We had major issues with water pressure throughout our stay but according to John there was a plumbing issue and that is not normal. Wi Fi was excellent. We did not have a car and there is only a very tiny market at the foot of the village so it was a bit tricky getting provisions. We have stayed in many VRBO houses and some are better than others at providing the basics, some washing machine soap, handsoap in the bath etc. There were none here so make sure you get what you need before you arrive. With a car you could go to the market in the next village but with no car it was tricky because not only was the local market tiny, the very, steep walk down to the village was not something you wanted to do more than once a day. It is very arduous for even the most fit among us so be warned - you aren't going to be dashing up and down the hill to be coming and going. Argegno is an absolutely lovely little town with great food! Restaurants do fill up in the evening so good to call ahead although we weren't great at calling ahead and they were super accommodating about squeezing us in. Zoe's gelato is top notch! John set us up car service from Milan airport with Andrea and he was awesome - highly recommend him for any car service. Cable car up to Pigra was great with beautiful views - we had a casual lunch at the top. We also did a day trip via Bus to Como and did the funicular up to Brunate which was AMAZING! Bus service is inexpensive - the ride to Como is a thrill ride in itself - very scenic! Our bus back was not as smooth but there was a big festival going on so that probably didn't help. We did day trips to Bellagio and Menaggio and to both the Villa Carlotta and Villa del Balbianella. The later was one of the highlights of our trip - Stunning!! I'm delighted you enjoyed it.. That airlock in the system was resolved by plumber first thing on Monday morning. I'm so sorry for the disruption - but it was just one of those things..
We had a great time and fully enjoyed the patio views. The owner provided excellent instructions for the house and all went to plan. That's great guys! Delighted you enjoyed your trip to the Lake! A very comfortable stay for our family of 5 adults and 3 children. Well equipped house and good secure parking for our two cars. Argegno is a steep walk down but well worth the effort - good family restaurants. Excellent Lido for families. Boats for Lake Como travel provide good service to other towns. Cable car to Pigra is well worth a trip. A very relaxing and enjoyable stay. Very nice home in a great location on lake como. Great view, lots of space and everything you might need in a holiday rental. Thx guys - delighted you enjoyed your break! We (6 adults, one 15 month old) stayed at the property for 12 days and enjoyed it very much. The location and view were fabulous, although the steep walk to and from the village should be emphasized. We appreciated the crib and highchair for the youngest member of the group. After three days without Wifi a new modem was purchased, which solved the issue. Much appreciated! The restaurant recommendation for the beautiful place in St. Anna was wonderful! However, there had been no indication in the description that the bedroom in the basement has NO window and was definitely not a place where you want to spend a lot of time, particularly since it is so small that you can't walk around the bed. Describing it as a room without lake view is a bit of a stretch. The contact person never came to the house and when called, did not appear to speak any English. Luckily one member of our party was fluent in Italian. Hi Susanne, I'm so sorry to read your comments. Our views are afforded by the location perched directly above the village. It's a very short - but I agree steep walk back up. The room in the basement doesn't have a window and I tried to make this as clear as possible in the description. I'm so sorry that we got our wires crossed. I do realise the rooms is defiintely the smallest room - but it's cool in summer time. It's also far from the rest of the accommodation at the villa. I accept your comments about it's size - and I apologise for any confusion. 5 min stroll to local beach beside pizzeria that rents sunloungers etc. Plenty of other beaches/lidos all within 15 min drive along the lake. 10 min drive to pool (lido) in Cadenabbia or Lenno lido with bar and food all day. Milan Linate 1 hour. Milan Malpensa 40 mins. Milan Bergamo 1.5 hrs. All airports have rail links to Milan. Trains run frequently to Como town from Milan with regular bus service to Argegno Car hire recommended as there is so much to see. Monza 40 mins. Como town 20 mins. Laglio (home village of George Clooney) 5 mins drive. Lake Lugano and Switzerland are only 30 mins away with fantastic mountain drives. Local bank in village with 2 cash machines (Bancomat). Cable car to Pigra (mountain village) from Argegno with amazing lake views. Lake Lugano and Switzerland are only 30 mins away with fantastic mountain drives and the entire lake is available to you with the fantastic ferry services (fast, slow and car ferries).Visit Villa Carlotta and see it's beautiful gardens in many styles with lake views to die for! Villa Serbollini in Bellagio with unrivalled panoramic views is a fantastic day out. Bellagio itself is a perennial favourite for holiday makers with it's cobbled streets and unbeatable views. Do not miss Villa Balbianello in Lenno as featured in the 007 James Bond Casino Royale movie. Walk to the villa or take the private boat (5 euros) from Lenno lido (15 minutes by car from the villa) with golden sandy man made beach. The villa and it's majestic gardens overlook the rich blue waters of the lake. Drive down to Cernobbio (15 minutes south of the villa) for an idyllic lakeside walk, a favourite for a Sunday stroll. Menaggio, with it's palm lined walkways is another pretty lake village worth exploring. Many boat activities from windsurfing to sailing are available on the lake as well as other water sports. Mountain bikes are also available for hire if you wish to venture into the vast mountains that surround the lake. Sant Anna and La Griglia nearby serve superb seasonal and regional cuisine with excellent wine lists and are just 10 minutes walk from the villa. Argegno village is full of excellent restaurants from fresh lake fish (Emilio's), pizza (La Corte), Barchetta-typical local cuisine and upmarket dining at La Piazetta. Booking Notes: Contact by email. 20% by time of booking. Balance 8 weeks prior to arrival. A fully refundable security deposit of 400 euros to be paid to agent on arrival. This will be returned on last day in euros. Changeover Day: Preferred Saturday - although possible flexibility depending on seasonality. Notes on prices: Prices displayed are the weekly euro rates. 20% deposit secures, with balance due 8 weeks prior to arrival. Cleaning fee of 150 euro is payable upon arrival. A fully refundable security deposit of 400 Euros is payable upon arrival. The deposit is refunded upon departure. Shorter bookings may be available off peak. Prices include gas and electricity. Saturday is the normal change-over day unless otherwise agreed. Latest check-out time is 10am. Earliest check-in time is 2.30pm.